The weeks stock market trend was in one word WEAK, the preceding weeks strong close FAILED to have any follow through, the stock market FAILED to break above 8,400 let alone make it to resistance at 8,600, stocks turned lower to target the lower end of the trading range of between 8,400 and 7,800, including a BEARISH break below support, which triggered the Plunge Protection Team (PPT) into action to support the stock market and bring the selling to a halt, for the time being at least. As I mentioned last week , we are in a stocks bear market that is targeting fresh lows with a target as of 20th January of 6,600 on the DJIA, and 3,400 on the FTSE 100. The battle being waged is that of debt deleveraging and economic contraction against ever more desperate government interventions that are increasingly buying up anything and everything in an attempt to plug holes in the bursting deflationary dam. Therefore short-term stock trends are subject to government intervention warping chart price action i.e. generating false triggers that can catch traders out. The seasonal trend is for a rally into late April / early May, there was limited evidence for this the week before, however the weeks trend hit a brick wall as the bear market has attempted to reassert itself. Therefore my analysis suggests that next week will continue to see this battle being played out between the bear trend against seasonal tendencies coupled with government intervention, eventually the governments will lose as the bear trend reasserts itself as there is plenty of time for the bear trend to unfold, if anything the weeks weakness suggests that the lower target of 6,000 is now becoming more probable. In conclusion the stocks bear market continues to target DJIA between 6,600 and 6,000 by July 2009. The short-term trend is exhibiting much volatility. Its a tough call but I would not be surprised if stocks closed higher next week inline with seasonal pressures, in which regard one would look to oversold banking stocks / financials to lead the market higher. II am expecting stocks to be contained within the trading range of between 8,400 and 7,700 for another week, with trend targeting immediate resistance at 8,300. A break below 7,700 would negate this short-term corrective scenario. 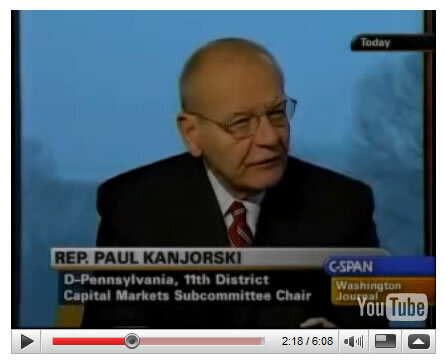 2 minutes and 20 seconds into this C-Span video clip, Rep. Paul Kanjorski of Pennsylvania explains how the Federal Reserve told Congress members about a "tremendous draw-down of money market accounts in the United States, to the tune of $550 billion dollars." According to Kanjorski, this electronic transfer occurred over the period of an hour and threatened a further $5 trillion to be drawn out triggering a total collapse of the Worlds Financial System, which then prompted Hank Paulson's emergency $700 billion TARP bailout action. Following Septembers close call with Financial Armageddon the governments of the world have been busy recapitalising bankrupt banks with tax payers monies, however the $500 trillion derivatives monster continues to deleverage and thereby implying that the risks of financial armageddon have only marginally improved on September 2008. There still exists the high potential risk of financial and economic collapse that would be accompanied by eye-wateringly extreme currency market volatility and probable seizure. And much more in Prechter's FREE Deflation Survival Guide. Your stock index futures trading analyst. Whilst the great inflation/deflation debate continues (its deflation that wins, the inflationistas are being misled by the Fed's actions with its bail out facilities) we need to look at some startling new facts and projections that have appeared in the public arena. 3. Stock Market to Fall AT LEAST Another 40%! Whilst today's headlines have been grabbed by Barack Obama's U.S. Economic Stimulus package of $800 billion, which is part of a global collective total of approximate $2 trillion of stimulus spending that has been committed for during the next 1 to 2 years. However the fact of the matter is that this does not even come close to countering the REAL Deflationary impact of the $30 trillion across the board loss of value of assets from real estate, to stocks to commodities. 7. Financial Markets Analysis: Stocks Bounce, Where Next? Stock Markets continued their strong rally on Friday from early week lows that had threatened to break below the recent tight trading range and target fresh bear market lows. Contrary to what you might believe, the Great Depression of the 1930s was not a decade-long era of economic decline. Rather, the Great Depression was made up of two distinct economic slumps - August 1929 through March 1933 and May 1937 through June 1938. The Washington Post is Taking Apart the $819 billion Stimulus Package with a couple of graphs that show how and when the stimulus money will be spent. Here is one of the graphs. Last week was exciting as the broad market dipped back down to test Hogan's Bottom again. The market found support and posted a nice two day rally on increased volume as buyers stepped back into the market.